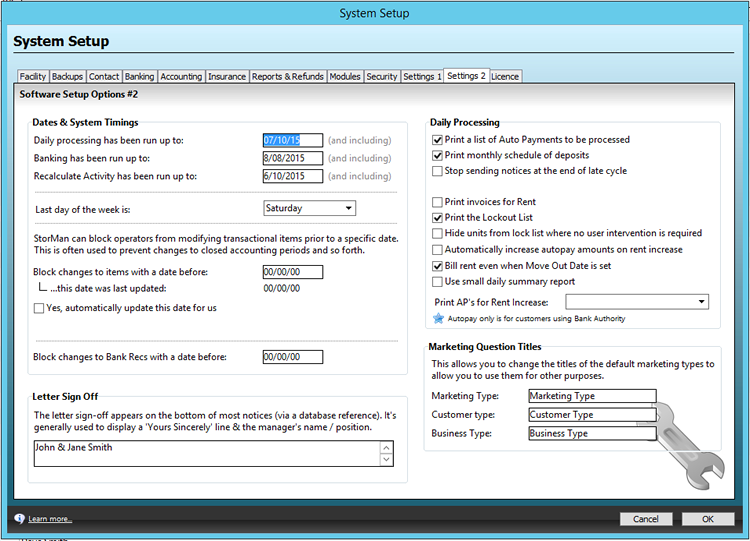 This article explains what each field is and does under the Setting 2 tab in system setup. Dates & System Timings shows the date of the most recent Daily Processing, Banking and Recalculate Activity (i.e. the latest date that Activity has been calculated up to; this will always trail the Last Daily Processing date by 1 day). Here, you can also set the Last day of the week, as well as block staff from being able to make changes to items before a certain date (with an option to continually update the date), as well as block changes to Bank Recs on (or before) a certain date. Letter Sign Off is a 4D autofill field that you can add at the bottom of your Notice letters or e-mails, to automatically insert the name of the latest Manager of the site. The options within the Daily Processing section are self explanatory. Of note in this section, is the option to Automatically increase AutoPay amounts when a rent increase affects that Customer and whether to continue billing rent, even if a Move Out Date is set (and that date passes). The final option lets you set who to print AutoPay forms for, when a rent change (eg. Rent Increase / Rent Decrease) is performed. The Marketing Questions Titles section lets you edit the names (field labels) next to the three Marketing Questions found on Sales Enquiries, Reservations, Agreements and Other Credit Sales.